This week Sheeran recorded a video message for New Zealanders before his much-anticipated March concerts there. “Hey New Zealand I can’t wait to see you very soon, I’m not yet a citizen of New Zealand but I’m working on it – hook me up prime minister, please,” said Sheeran, in the video for local radio station ZM. New Zealand’s leader, 37-year-old Jacinda Ardern – a well-known music fan and occasional DJ – responded to the singer’s request with a 35-second video of her own, recorded in her parliamentary office in Wellington. “Hello Ed, my name is Jacinda Ardern, I’m the prime minister of New Zealand and I understand you’ve put through a very informal request for citizenship,” says Ardern, mock-serious. Pineapple lumps are a distinctly nostalgic New Zealand treat, a chewy chocolate-covered sweet with a sweet pineapple-flavoured soft centre, which New Zealanders often keep in the freezer. Jandals – also known as flip-flops or thongs – are often worn by New Zealanders throughout the year, including winter, and sometimes with suits or dresses to formal events (for comfort’s sake). It is thought to be a derivation of “Japanese sandals”. I think I know where Ardern got the “semi-inappropriate situations” thing, for this is on her Facebook page. They aren’t jandals, I think, but come close. . . This entry was written by whyevolutionistrue and posted on November 30, 2017 at 2:30 pm and filed under travel. Bookmark the permalink. Follow any comments here with the RSS feed for this post. Both comments and trackbacks are currently closed. Oh for a prime minister with a sense of humour. And no, waving a box of cough sweets at the chancellor of the exchequer does count. Love (fresh) pineapple and love chocolate but the combo sounds pretty awful to me ( worse than bacon + chocolate). It’s actually not bad because it’s processed candy not actual pineapple. My mother loves pineapple lumps so anyone coming from NZ has to get some. I once forgot but found some in the airport in Sydney so not even in NZ. They are delicious Merilee! A bit too delicious – it’s easy to eat too many! When in NZ I found ginger chunks encased in dark chocolate. Divine! I hope you brush your teeth after eating the ginger chunks. Heck yea. The All Blacks are the best. Sorry as a NZer, I find all this incredibly corny. Perhaps its not aimed at New Zealanders. So is Pascal(l)’s wager “bet you can’t east just one pineapple lump”? She is quite the essentialist though. She declines to oppose elections that whites are not allowed to participate in. Sad. A song about Jandalsby Kiwi comedian, Rhys Darby. Oops and now I’ve embedded. I’m having HTML brain farts. “Para” – Para Rubber – used to be a chain of stores that sold all things rubber, from jandals to hose to paddling pools. It seems a weird sort of category to specialise in. I haven’t noticed one for years but Google says they still exist. 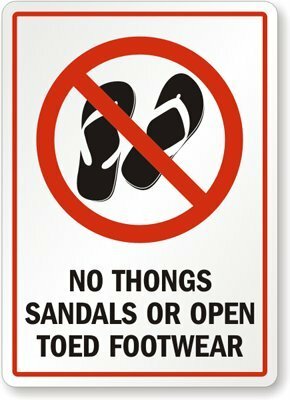 A common sign outside nicer restaurants and bars is “no jandals” because they’re so common, especially in the summer. Personally I can’t stand jandals. Trouble is, they’re so insecure – on uneven ground your heel twists sideways off the back of the thing and jams into the gravel/mud/rocks while the thong tries to wrench your toes off. Jacinta’s TV footwear is considerably more stable. If I have to wear shoe-like things I just wear sandals (or whatever they’re called) usually the minimalist sort with velcro straps but I prefer that traditional Kiiwi footwear – just feet. I hate two them too but I have bad feet and need orthotics so jandals are horribly painful for me. And my bad feet are from my mom’s kiwi family so…. Talking about the All-Blacks, it was thanks to my first-cousin Prince Alexander Obolensky that England beat the All-Blacks for the first time in Rugby history! Sadly, he died a few years later. I don’t think the “died” link is correct. “Such is fame, although, alas, Obolensky didn’t live long enough to fully enjoy his celebrity status. By the age of 24 he was dead, killed in a training accident with 54 Squadron on March 29, 1940 while practising his landings in a Hawker Hurricane at RAF Martlesham Heath, in Suffolk – the first of England’s many rugby internationals to be killed in the Second World War. That’s interesting. That’s almost exactly what happened to the first squadron leader of Hornet squadron in Piece of Cake. I wonder if Derek Robinson knew of the incident. Thank you for sharing this. Looks like he played outside center. I wonder if Sheeran had instead expressed wanting to move to the U.S. what Trump would have said in an analogous video…? Personally, I think it should be a crime,(punishable up to five years imprisonment), for men to wear flip-flops. Usually women’s feet are divine, while men’s are dirty, hairy ugly eyesores. If you’re a Kiwi, you wear jandals in the summer, usually with white sock marks on your ankles because you had to wear shoes and socks with the obligatory shorts while tramping in the bush or working. In a lab where corrosive reagents are on hand and will, given enough time, inevitably get spilled onto your protective footwear? Unless of course you aren’t using protection? Seems a no-brainer to me. I hate jandals, which I didn’t know were called jandals. I’m assuming it’s an NZ thing to call them jandals? I love anything sweet so would adore pineapple lumps. Sadly, being diabetic I can’t actually eat them. I love wearing jandals mainly cos I’ve got very sweaty feet so I need to let my feet breathe. Unfortunately, it’s far too cold most of the time here in the UK so I don’t get to wear them much. I’d love to make NZ my home!!! That’s it then, I should qualify for NZ citizenship. Now, how do I go about applying? Bet Ed Sheeran’s ‘request’ has something to do with Middle Earth and his hobbitiness.